1. MARY6 RILEY (JOHN5, EDWARD4, WILLIAM3, EDWARD2, EDWARD1) was born Bef. 30 Oct 1815 in Orange County North Carolina. She married THOMAS GAY Abt. 1830 in Darlington District, South Carolina. He was born 1810 in North Carolina, and died 21 Apr 1848 in Dale County Alabama. The 1850 U. S. Census of Dale County Alabama lists a Mary Gay in household 182 in the midst of the other Riley children. Her age was listed as 35 years and her place of birth was North Carolina. Mary, the widow of John Senior and mother of these Riley children, was living with her. There was no male listed in the household but Mary was living on the 120 acre farm, that was acquired by Thomas Gay. BLM records indicate that Thomas Gay purchased 80 acres on July 1, 1841 and another 40 acres on September 1, 1849.He was not listed on the 1850 Census as he was deceased at that time, There was a Thomas Gay listed on the 1840 Dale County Census and on the Darlington County South Carolina Census for 1820 and 1830. The 1830 Census List Thomas Gay from age 15-20 and a wife who has been determined to be Mary Riley from age 15-20. There was also another male from age 40-50 who was probably the father of Thomas. Indications are that they moved from SC. 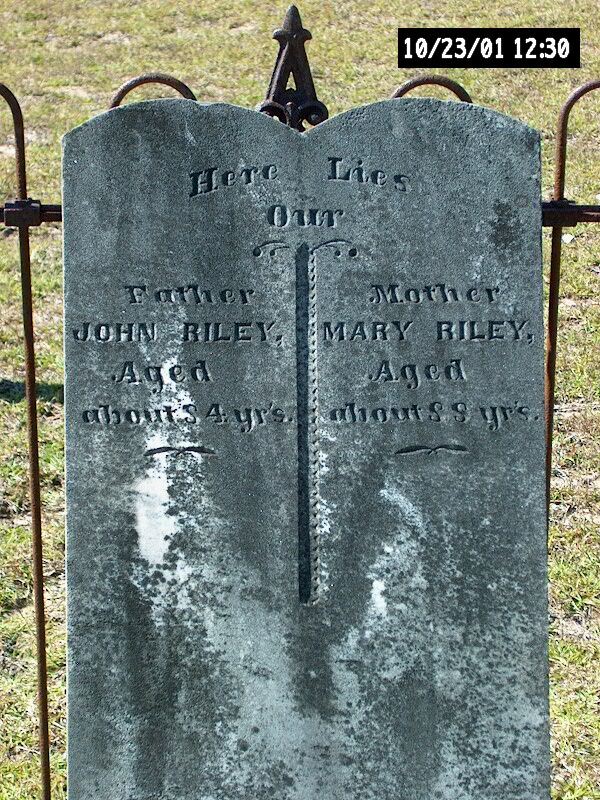 to Ala, about 1833 and settled in close proximity to the other Riley families. No evidence of Mary's whereabouts after 1850 have been found. 2. i. ARGENT7 GAY, b. 01 Oct 1833, Echo, Dale County Alabama; d. 23 Aug 1900, Dale County Alabama. 2. ARGENT7 GAY (MARY6 RILEY, JOHN5, EDWARD4, WILLIAM3, EDWARD2, EDWARD1) was born 01 Oct 1833 in Echo, Dale County Alabama, and died 23 Aug 1900 in Dale County Alabama. She married (1) JOEL JEHOIAKIM ACUM E. BRANNON 05 Feb 1849 in Henry County Alabama, son of ROSIER BRANNON and ANZILLA GALLOWAY. He was born 12 May 1831 in Henry County Alabama, and died 24 May 1864 in Near New Hope Church, Dallas, Paulding County Georgia, CSA Casualty. She married (2) LARKIN REED BAGWELL 20 Aug 1876 in Dale County Alabama, son of REDEN BAGWELL and RHODA CORLEY. He was born 09 Sep 1841 in Gwinnett County Georgia, and died 29 Jan 1905 in Dale County Alabama. Joel, called Acom, served in Company B, 33 Alabama Infantry Battalion, CSA , and reportedly died of disease at Thunnel Hill near New Hope Georgia. Larkin served in Company G, 15th Alabama Infantry Regiment CSA. He was wounded and lost a leg at the Battle at Chickamauga Georgia. i. ARGENT8 BRANNON, b. 29 Oct 1850, Dale County Alabama; d. 15 May 1857, Dale County Alabama. 3. ii. THOMAS BRANNON, b. 11 Oct 1851, Henry County Alabama; d. Sep 1931, Dale County Alabama. 4. iii. PERMELIA ANZILLA BRANNON, b. Nov 1855, Henry County Alabama; d. 1925, Dale County Alabama. iv. JOHN BRANNON, b. 1857, Dale County Alabama. John was not listed in the 1870 Census and no other record has been found on him. 5. v. ROBERT EDWARD BRANNON, SR, b. 03 Apr 1860, Henry County Alabama; d. 30 Sep 1939, Henry County Alabama. 6. vi. WILLIAM RILEY8 BAGWELL, b. 05 Dec 1877, Dale County Alabama; d. 23 Feb 1941, Dale County Alabama. 7. vii. MARY CORDELIA BAGWELL, b. Jul 1879, Dale County Alabama; d. 22 Dec 1960, Hartford, Geneva County Alabama. 3. THOMAS8 BRANNON (ARGENT7 GAY, MARY6 RILEY, JOHN5, EDWARD4, WILLIAM3, EDWARD2, EDWARD1) was born 11 Oct 1851 in Henry County Alabama, and died Sep 1931 in Dale County Alabama. He married SARAH AMANDA SMITH 24 Sep 1874 in Curetons Bridge, Dale County Alabama, daughter of RICHARD SMITH and SARAH CLEWIS. She was born 22 Sep 1854 in Henry County Alabama, and died 16 Mar 1949 in Henry County Alabama. 8. i. DAZZIE H.9 BRANNON, b. 24 Mar 1875, Dale County Alabama; d. Sep 1963, Panama City, Bay County Florida. ii. LEANDER A. BRANNON, b. 08 Oct 1876, Dale County Alabama; d. 17 Nov 1876, Henry County Alabama. 9. iii. RICHARD ACOM BRANNON, SR, b. 19 Oct 1877, Newville, Henry County Alabama; d. 23 Mar 1934, Headland, Henry County Alabama. iv. H. EUDORA BRANNON, b. 20 Feb 1880, Dale County Alabama; d. 22 Aug 1880, Henry County Alabama. 10. v. COLEY MALACHI BRANNON, b. 02 Jan 1882, Dale County Alabama; d. 30 Dec 1952, Houston County Alabama. vi. JAMES E. BRANNON, b. 10 Jun 1885, Dale County Alabama; d. 08 Oct 1933, Headland, Henry County Alabama; m. CLAUDIA C. HUNT; b. 13 Jan 1884, Dale County Alabama; d. 10 Sep 1953, Henry County Alabama. 11. vii. L.T. LOUIS THOMAS BRANNON, b. 31 Oct 1887, Dale County Alabama; d. May 1974, Headland, Henry County Alabama. 12. viii. EFFIE C. BRANNON, b. 25 Sep 1889, Dale County Alabama; d. 13 Sep 1982, Albany, Dougherty County Georgia. 13. ix. CHARLES FRANCIS BRANNON, SR, b. 03 Jun 1891, Dale County Alabama; d. 18 Jun 1963, Polk County Florida. 14. x. CLAUDIA BEATRICE BRANNON, b. 26 May 1893, Dale County Alabama; d. 10 Mar 1919, Dale County Alabama. 15. xi. MAYME LOUSIA BRANNON, b. 23 Mar 1895, Dale County Alabama; d. 14 Sep 1985, Dale County Alabama. xii. ELENDER BRANNON, b. 20 Oct 1896, Dale County Alabama; d. 12 Nov 1896, Dale County Alabama. 4. PERMELIA ANZILLA8 BRANNON (ARGENT7 GAY, MARY6 RILEY, JOHN5, EDWARD4, WILLIAM3, EDWARD2, EDWARD1) was born Nov 1855 in Henry County Alabama, and died 1925 in Dale County Alabama. She married DARLING BUFORD TRUITT 1877 in Henry County Alabama, son of CURTIS TRUITT and ZILPHA WINDHAM. He was born 1853 in Dale County Alabama, and died 27 Feb 1935 in Newton, Dale County Alabama. 16. i. LAURA C.9 TRUITT, b. 16 Jan 1879, Henry County Alabama; d. 27 Jan 1961, Henry County Alabama. 17. ii. JASPER MARVIN TRUITT, b. 09 May 1880, Dale County Alabama; d. 06 Mar 1942, Birmingham, Jefferson County Alabama. 18. iii. IDA TRUITT, b. 1882, Dale County Alabama; d. 05 Jan 1965, Ozark, Dale County Alabama. 19. iv. HELEN TRUITT, b. 1886, Dale County Alabama; d. 05 May 1968, Andalusia, Covington County Alabama. v. NANCY J. TRUITT, b. 1886, Dale County Alabama. vi. ELIZABETH LIZZIE TRUITT, b. 1888, Dale County Alabama; m. J. P. ROBERTS; b. 1828; d. 1959. 20. vii. ZIMMERMAN CONIE TRUITT, b. 13 Dec 1888, Dale County Alabama; d. 18 Mar 1932, Troy, Pike County Alabama. viii. ARGENT H. TRUITT, b. 1891, Dale County Alabama. ix. MOLLIE V. TRUITT, b. 1893, Dale County Alabama. x. LEILA Z. TRUITT, b. 1895, Dale County Alabama. xi. LONIE L. TRUITT, b. 1897, Dale County Alabama. xii. LOVIE B. TRUITT, b. 1898, Dale County Alabama; m. WHITSETT. 5. ROBERT EDWARD8 BRANNON, SR (ARGENT7 GAY, MARY6 RILEY, JOHN5, EDWARD4, WILLIAM3, EDWARD2, EDWARD1) was born 03 Apr 1860 in Henry County Alabama, and died 30 Sep 1939 in Henry County Alabama. He married ELIZABETH JANE DEAL, daughter of RANSOM DEAL and OLIVIA MATTHEWS. She was born 22 Oct 1860 in Dale County Alabama, and died 01 Jun 1938 in Henry County Alabama. 21. i. DAISEY MAUD9 BRANNON, b. 16 Dec 1882, Headland, Henry County Alabama; d. 17 Nov 1978, Columbus, Muscogee County Georgia. 22. ii. RANSOM DAYTON BRANNON, b. 20 Oct 1884, Center Community, Henry County Alabama; d. Apr 1979, Henry County Alabama. 23. iii. OLIVIA JANE BRANNON, b. 17 Apr 1887, Center Community, Henry County Alabama; d. 24 Sep 1982, Dale County Alabama. 24. iv. HESTER IRENE HETTIE BRANNON, b. 26 Jan 1890, Center Community, Henry County Alabama; d. 07 Apr 1952, Henry County Alabama. 25. v. ANNIE PEARL BRANNON, b. 31 Dec 1890, Center Community, Henry County Alabama; d. 02 Feb 1975, Montezuma, Macon County Georgia. 26. vi. ROBERT EDWARD BRANNON, JR, b. 14 Nov 1895, Center Community, Henry County Alabama; d. 18 Sep 1965, Toomsuba Mississippi. 27. vii. HERSCHEL PITT BRANNON, b. 09 Jan 1898, Center Community, Henry County Alabama; d. 08 Nov 1970, Abbeville, Henry County Alabama. 6. WILLIAM RILEY8 BAGWELL (ARGENT7 GAY, MARY6 RILEY, JOHN5, EDWARD4, WILLIAM3, EDWARD2, EDWARD1) was born 05 Dec 1877 in Dale County Alabama, and died 23 Feb 1941 in Dale County Alabama. He married MAMIE FLOYD BEASLEY 09 Nov 1902 in Dale County Alabama, daughter of THOMAS BEASLEY and SUSAN MATHEWS. She was born 19 Dec 1886 in Dale County Alabama, and died 03 Sep 1960 in Dale County Alabama. 28. i. HOMER RALPH9 BAGWELL, b. 22 Jan 1906, Dale County Alabama; d. 02 Jan 1994, Dale County Alabama. 29. ii. LEE ROY BAGWELL, b. 08 Jul 1908, Dale County Alabama; d. 05 Sep 1988, Ozark, Dale County Alabama. 30. iii. RAIFORD OSCAR BAGWELL, b. 28 Feb 1911, Dale County Alabama. 31. iv. RUBY DOVIE BAGWELL, b. 04 May 1913, Dale County Alabama; d. 11 Jun 1992. 32. v. ROBERT THOMAS BAGWELL, SR, b. 25 Apr 1916, Dale County Alabama; d. 18 May 1999.
vi. MARY ALLINE BAGWELL, b. 27 Mar 1918, Dale County Alabama; d. 10 Oct 1920, Dale County Alabama. Mary died a tragic death when her night gown caught fire as she was warming in front of an open fireplace..
vii. NORMA LOUISE BAGWELL, b. 10 Jun 1920, Dale County Alabama; d. 11 Dec 1970, Bay County Florida; m. THOMAS J. PIPPIN; b. 1917, Washington County Florida. 33. viii. IRMA LOIS BAGWELL, b. 20 Sep 1923, Dale County Alabama. 34. ix. DORIS ANNETTE BAGWELL, b. 10 Oct 1929, Dale County Alabama. 7. MARY CORDELIA8 BAGWELL (ARGENT7 GAY, MARY6 RILEY, JOHN5, EDWARD4, WILLIAM3, EDWARD2, EDWARD1) was born Jul 1879 in Dale County Alabama, and died 22 Dec 1960 in Hartford, Geneva County Alabama. She married JOSEPH NORTON MONROE PEACOCK 06 Jan 1901 in Dale County Alabama, son of JAMES PEACOCK and MARTHA HAMILTON. He was born 21 Sep 1865 in Cotton Hill, Clay County Georgia, and died 05 Aug 1934 in Geneva County Alabama. 35. i. PEARL J.9 PEACOCK, b. 30 Apr 1903, Geneva County Alabama; d. 12 Mar 1975, Dothan, Houston County Alabama. ii. RUBY J. PEACOCK, b. 17 Sep 1905, Geneva County Alabama; d. 16 Nov 1968, Hartford, Geneva County Alabama; m. WALTER GLEN SHEPPARD, 25 Oct 1925, Geneva County Alabama; b. 1905.
iii. GLADYS GYPSIE PEACOCK, b. 03 Feb 1907, Geneva County Alabama; d. 28 Mar 1983, Geneva County Alabama; m. ARCUS D. BYRD, 09 Oct 1927; b. 1907, Alabama. iv. THOMAS WATSON PEACOCK, b. 1909, Geneva County Alabama; d. 17 Mar 1964, Tuscaloosa, Tuscaloosa County Alabama. v. INFANT PEACOCK, b. Feb 1910, Geneva County Alabama; d. Bef. 1920, Geneva County Alabama. vi. EUVONA C. PEACOCK, b. 1911, Geneva County Alabama. vii. TRAVIS ODELL PEACOCK, b. 11 Sep 1913, Geneva County Alabama; d. 31 Jul 2003, Hartford, Geneva County Alabama; m. ARDITH COLLINS. viii. MAURIE EDNA PEACOCK, b. 02 May 1915, Geneva County Alabama; d. 10 Oct 2010, Hartford, Geneva County Alabama; m. JIM MILLER. ix. JAMES TRUITT PEACOCK, b. 17 Jun 1917, Geneva County Alabama; d. 22 Apr 1968, Geneva County Alabama. x. MARY PEACOCK, b. 15 Apr 1920, Geneva County Alabama; m. WALTER ATKINS, 04 Oct 1940.
xi. WILLIAM LARKIN PEACOCK, b. 13 Nov 1922, Geneva County Alabama; d. 14 Mar 2002, Hartford, Geneva County Alabama. 8. DAZZIE H.9 BRANNON (THOMAS8, ARGENT7 GAY, MARY6 RILEY, JOHN5, EDWARD4, WILLIAM3, EDWARD2, EDWARD1) was born 24 Mar 1875 in Dale County Alabama, and died Sep 1963 in Panama City, Bay County Florida. He married EMMA ANZILLA BRANNON 20 Jan 1901, daughter of PILLIE BRANNON. She was born 1879 in Alabama, and died in Panama City, Bay County Florida. 36. i. HATTIE LILLIAN10 BRANNON, b. 17 Nov 1917, Henry County Alabama; d. 19 Nov 2009, Lynn Haven, Bay County Florida. 9. RICHARD ACOM9 BRANNON, SR (THOMAS8, ARGENT7 GAY, MARY6 RILEY, JOHN5, EDWARD4, WILLIAM3, EDWARD2, EDWARD1) was born 19 Oct 1877 in Newville, Henry County Alabama, and died 23 Mar 1934 in Headland, Henry County Alabama. He married NORAH A. BRANNON 26 Oct 1906 in Newville, Henry County Alabama, daughter of JAMES BRANNON and SARAH BESS. She was born 23 Dec 1873 in Newville, Henry County Alabama, and died 12 Dec 1959 in Dale County Alabama. i. INFANT10 BRANNON, b. 28 Aug 1907, Headland, Henry County Alabama; d. 28 Aug 1907, Henry County Alabama. ii. HORACE RUPERT BRANNON, b. 20 Sep 1908, Headland, Henry County Alabama; d. 27 Aug 1991, Raton, Colfax County New Mexico; m. SARAH M. GRANT, 07 Dec 1935, San Diego California; b. 17 May 1910; d. 29 Nov 1998, Raton, Colfax County New Mexico. iii. MARY EVELYN BRANNON, b. 23 May 1911, Headland, Henry County Alabama; d. 1989; m. (1) W. P. JONES; m. (2) PETERSON. iv. ROSA (NORA) A. BRANNON, b. 1913, Headland, Henry County Alabama; d. 21 Feb 1913, Tuscaloosa, Tuscaloosa County Alabama; m. WILLIAM L. WILLIS; b. 04 Dec 1913, Florida; d. 24 Nov 1995, Summerdale, Baldwin County Alabama. v. RICHARD ACOM BRANNON, JR, b. 03 Jun 1919, Headland, Henry County Alabama; d. 20 Jan 1940, Henry County Alabama. 10. COLEY MALACHI9 BRANNON (THOMAS8, ARGENT7 GAY, MARY6 RILEY, JOHN5, EDWARD4, WILLIAM3, EDWARD2, EDWARD1) was born 02 Jan 1882 in Dale County Alabama, and died 30 Dec 1952 in Houston County Alabama. He married VERA ALICE MURPHY, daughter of GEORGE MURPHY and DELIA CAPPS. She was born 1890 in Henry County Alabama. 37. i. THELMA ALINE10 BRANNON, b. 1911, Headland, Henry County Alabama. ii. ADDIE LOUISE BRANNON, b. 1914, Headland, Henry County Alabama; m. CHARLES GAINES. 11. L.T. LOUIS THOMAS9 BRANNON (THOMAS8, ARGENT7 GAY, MARY6 RILEY, JOHN5, EDWARD4, WILLIAM3, EDWARD2, EDWARD1) was born 31 Oct 1887 in Dale County Alabama, and died May 1974 in Headland, Henry County Alabama. He married SARAH CATHERINE WOODS. She was born 1889 in Alabama, and died 23 Nov 1967 in Dothan, Houston County Alabama. i. ELEANOR M.10 BRANNON, b. 1913, Headland, Henry County Alabama; m. ROBERT SHAW. ii. JULIAN A. BRANNON, b. 04 May 1918, Headland, Henry County Alabama; m. GRACE VANN. 12. EFFIE C.9 BRANNON (THOMAS8, ARGENT7 GAY, MARY6 RILEY, JOHN5, EDWARD4, WILLIAM3, EDWARD2, EDWARD1) was born 25 Sep 1889 in Dale County Alabama, and died 13 Sep 1982 in Albany, Dougherty County Georgia. She married COLEMAN ESAU RILEY 03 Oct 1909 in Dale County Alabama, son of JOSEPH RILEY and SARA JOHNSON. He was born 16 Apr 1884 in Dale County Alabama, and died 15 Mar 1979 in Albany, Dougherty County Georgia. i. CLYTELE10 RILEY, b. 1908, Dale County Alabama; d. 09 Jan 1991, Albany, Dougherty County Georgia; m. FRED WATKINS. ii. HILLARY C. RILEY, b. 1912, Dale County Alabama; d. 15 Nov 1965, Albany, Dougherty County Georgia. iii. JACK RILEY, b. 1914, Dale County Alabama; d. 22 Dec 1980, Albany, Dougherty County Georgia; m. ELIZABETH TIMMERMAN. iv. CHELLE GRELL RILEY, b. Dec 1919, Dothan, Houston County Alabama; m. HENRY SMITH. v. EARL RILEY, b. 1922, Dothan, Houston County Alabama. vi. CHRISTINE RILEY, b. 1924, Dothan, Houston County Alabama, HH 77, age 6; m. THOMAS RAYMOND CANNON; b. 27 Nov 1920, Georgia; d. 1994, Leesburg, Lee County Georgia. 13. CHARLES FRANCIS9 BRANNON, SR (THOMAS8, ARGENT7 GAY, MARY6 RILEY, JOHN5, EDWARD4, WILLIAM3, EDWARD2, EDWARD1) was born 03 Jun 1891 in Dale County Alabama, and died 18 Jun 1963 in Polk County Florida. He married BESSIE B. ASBURY 1924 in Lakeland, Polk County Florida. She was born 15 Aug 1904 in Georgia, and died 10 Oct 1985 in Albany, Dougherty County Georgia. i. CHARLES FRANCIS10 BRANNON, JR, b. 10 Nov 1926, Polk County Florida; d. 24 Nov 2007, Kathleen, Polk County Florida. ii. WILLIAM T. BRANNON, b. 1929, Lakeland, Polk County Florida. 14. CLAUDIA BEATRICE9 BRANNON (THOMAS8, ARGENT7 GAY, MARY6 RILEY, JOHN5, EDWARD4, WILLIAM3, EDWARD2, EDWARD1) (Source: Riley.FTW, Date of Import: Aug 21, 2000.) was born 26 May 1893 in Dale County Alabama (Source: Riley.FTW, Date of Import: Aug 21, 2000. ), and died 10 Mar 1919 in Dale County Alabama. She married JAMES CARLEY RILEY 1909 in Dale County Alabama, son of JAMES RILEY and MARY DEAL. He was born 20 Dec 1889 in Echo, Dale County Alabama, and died 02 Oct 1961 in Dale County Alabama. i. RHEBA10 RILEY, b. 09 Oct 1910, Dale County Alabama; d. 20 Apr 2000, Frostproof, Plok County Florida; m. BASCOMB GRANDBERRY SMITH; b. 20 Feb 1918, Dale County Alabama; d. 30 Jun 1995, Andalusia, Covington County Alabama. ii. GARY D. RILEY, b. 07 Sep 1913, Dale County Alabama; d. 11 Jun 1996, Frostproof, Plok County Florida. 38. iii. JAMES THOMAS RILEY, b. 30 Dec 1916, Dale County Alabama; d. Feb 1980, Dothan, Houston County Alabama. iv. EDNA EURA RILEY, b. 16 Aug 1917, Dale County Alabama; d. 27 Oct 1999, Wauchula, Hardee County Florida; m. GEORGE NENTON. 15. MAYME LOUSIA9 BRANNON (THOMAS8, ARGENT7 GAY, MARY6 RILEY, JOHN5, EDWARD4, WILLIAM3, EDWARD2, EDWARD1) was born 23 Mar 1895 in Dale County Alabama, and died 14 Sep 1985 in Dale County Alabama. She married WILLIAM PRYOR SNELL 24 Oct 1916 in Henry County Alabama, son of JOHN SNELL and CHARLIE LEWIS. He was born 21 Sep 1885 in Dale County Alabama, and died 09 Jul 1949 in Henry County Alabama. viii. JOYCE DELAINE SNELL, b. 18 Dec 1937, Henry County Alabama; d. 15 Nov 1939, Henry County Alabama. 16. LAURA C.9 TRUITT (PERMELIA ANZILLA8 BRANNON, ARGENT7 GAY, MARY6 RILEY, JOHN5, EDWARD4, WILLIAM3, EDWARD2, EDWARD1) was born 16 Jan 1879 in Henry County Alabama, and died 27 Jan 1961 in Henry County Alabama. She married MARION BRYANT AMAN 08 Feb 1902 in Dale County Alabama, son of PHILLIP AMAN and ARVEY BAREFIELD. He was born 10 Sep 1877 in Dale County Alabama, and died 07 Apr 1960 in Dale County Alabama. i. GERTIE LILLIE10 AMAN, b. 06 Feb 1903, Dale County Alabama; d. 01 Nov 1903, Dale County Alabama. 45. ii. ALICE AMAN, b. 26 Mar 1904, Dale County Alabama; d. May 1975, Decatur, Morgan County Alabama. 46. iii. CLARENCE AMAN, b. 10 Apr 1906, Dale County Alabama; d. Jan 1977, Eufaula, Barbour County Alabama. 47. iv. BOYD AMAN, b. 25 Feb 1908, Dale County Alabama; d. 12 Jun 2002, Eutaw, Greene County Alabama. 48. v. JEWELL AMAN, b. 30 Jun 1915, Dale County Alabama; d. 06 Oct 1983. 49. vi. CURTIS PHILIP AMAN, b. 01 Nov 1917, Dale County Alabama; d. 01 Feb 1977, Dale County Alabama. 17. JASPER MARVIN9 TRUITT (PERMELIA ANZILLA8 BRANNON, ARGENT7 GAY, MARY6 RILEY, JOHN5, EDWARD4, WILLIAM3, EDWARD2, EDWARD1) was born 09 May 1880 in Dale County Alabama, and died 06 Mar 1942 in Birmingham, Jefferson County Alabama. He married LOUISE. She was born 1887 in Alabama. i. BUFORD10 G.TRUITT, b. 1906, Alabama. ii. MAMIE S. TRUITT, b. 1907, Alabama. iii. MARVIN J. TRUITT, b. 1909, Alabama. iv. FRED HADDOCK TRUITT, b. Jan 1911, Alabama; d. 06 May 1912, Geneva County Alabama. v. PUGH R. TRUITT, b. 1913, Alabama. 18. IDA9 TRUITT (PERMELIA ANZILLA8 BRANNON, ARGENT7 GAY, MARY6 RILEY, JOHN5, EDWARD4, WILLIAM3, EDWARD2, EDWARD1) was born 1882 in Dale County Alabama, and died 05 Jan 1965 in Ozark, Dale County Alabama. She married ALTO JACKSON CARMICHAEL, son of ANDREW CARMICHAEL and NINA WIDGEON. He was born 02 Aug 1879 in Dale County Alabama, and died 20 Nov 1962 in Ozark, Dale County Alabama.